Recently, I asked our wonderful Human Services Coalition Listserv for assistance compiling a list of places where non-profit organizations can hang up posters or flyers with information about their upcoming events. I received multiple responses and compiled them here for you to use. Thank you for once again showing the cooperative nature of this listserv, as well as the willingness to help shown by other agencies in Tompkins County! If you want to add comments, or locations to this list, please click here to view the online version. Summer seems to be the season for fundraising! PEAKS has seen a lot of activity in the past few months. Read below to see which campaigns have recently finished up, which ones will be closing soon and campaigns that have just begun! Congratulations to these organizations for completing their crowdfunding campaigns! And check out some of the current campaigns below to see what these Changemakers are up to! For those of you that have been following Emma Frisch, PEAKS Founder and prior Executive Director, you know that her time on the Food Network has come to end. Emma made it through thousands of applicants, through a rigorous casting process and then made it to the FINAL SIX of the competition! We at PEAKS are so proud of Emma and all that she has done to shine a light on the Finger Lakes Region as a source for local, farm-to-fork freshness! You can still vote for Emma as FAN FAVORITE, and show her your support! PEAKS Founder, Emma Frisch, with Bobby Flay, Alton Brown and Giada De Laurentiis filming for the Food Network Star television show. We are continuously looking for feedback and ideas to improve PEAKS. If you have suggestions, comments, or concerns, please email us! First of all, Happy May! Summer is right around the corner, as evidenced by the peaking sun we’ve been seeing lately, and the absence (finally?) of SN*W! There are so many exciting things happening right now with PEAKS, it’s Staff (both current and previous) and with Cornell Cooperative Extension! If you haven’t yet checked out the CCE Calendar of Events for the Summer months, you can do it here! One of my personal favorite events, Bike to Work Day, is coming up on May 16th. Join hundreds of people as they bike to work in Tompkins County, and enjoy free breakfast at over a dozen different pit stops located all over the City of Ithaca and beyond! It’s amazing to see how much this event has grown since I began it back in my Way2Godays, so please, join in on the fun! And, be sure to stop by Teagle Hall between 7am-9am to visit with me, and for a special breakfast treat by Cornell Catering! For a full map of the stops, click here. We have several great campaigns that are now active, and just recently finished up a bunch more! Congratulations to Cayuga Pure Organics for reaching nearly $34,000 of their $42,000 goal, New York Youth Against Fracking for surpassing their goal and best of luck to the Chris Dennis Memorial Garden, the Youth Farm Project and theIHS/Dewitt Technology Student Association who are all well on their way to raising funds for thier organizations and projects! Summer looks like it’s going to be a busy time here at PEAKS, and we look forward to working with you all on your campigns, Changemakers! Probably some of the most exciting news that I have to share is about our former Director, Emma Frisch. Emma passed PEAKS to me in December of 2013 to pursue her passion and love for the culinary arts. 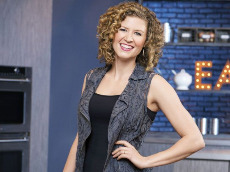 Just a few weeks ago, Emma announced that she will be a finalist on the Food Network Star airing on June 1st at 9pm!! Please be sure to LIKE Emma’s Facebook page, FRISCH KITCHEN and tune in to support PEAKS’s co-founder as she rises to fame! Food Network Star returns for tenth season with new cast. Food Network’s long-running competition series Food Network Star is back for a tenth season in June, with culinary icons Alton Brown, Giada De Laurentiis and Bobby Flay leading the charge to discover the next promising face in food television. Do you have a fundraising event coming up and need a registration platform?! PEAKS has successfully managed the registration for several large fundraising events, including one of Ithaca’s LARGEST 5k race ever, ITHACA GLOWS and the 4-H Color Splash Run. We are continuously looking for feedback and ideas to improve PEAKS. If you have suggestions, comments or concerns, please email us! PEAKS Welcomes New Director in 2014! I always welcome the holiday season as a time to reflect and give thanks. As I look back on the past twelve years while preparing for 2014, I feel truly blessed. I have a lot to be thankful for! At the top of my list is an exciting transition for PEAKS, which I’m writing to share with you today. After dedicating the past five years of my life to raising PEAKS, I feel confident that now is the time to pass my torch as Director and welcome fresh energy with the New Year. I have given my transition careful thought to ensure that it will be smooth and seamless, and that anyone affiliated with PEAKS will only benefit from this change. I’m honored to introduce you to Ray Weaver, the new Director of PEAKS! Ray is one of the most dynamic, creative, thoughtful, enthusiastic and dependable people I know. If I could choose anyone to fill my shoes, it would be Ray. I believe he truly has the talent and motivation to take PEAKS to new heights. I would like you to get to know Ray better, so please take a moment to read his full bio below. Don’t hesitate to reach out and welcome him on board! When I look back at what we have accomplished in the past two years alone, I feel proud and even a bit teary. We’re really making change happen here at PEAKS! We’ve helped over forty changemakers collectively raise more than ¼ million in funding. We’ve discovered that on average, 48% of the funds raised originated from outside the campaign’s host state, helping to overcome the competition for local resources while expanding donor networks. With our extraordinary web developer’s efforts and invaluable beta testing from our users, we launched PEAKS 2.0, a new version of the website with improved user-interface and functionality. That’s just the tip of the iceberg! In the spring, Ray will be hosting the first PEAKS Crowdfunding Certification at Cornell University, along with several exciting workshops and presentations that you will surely hear about. My own journey building PEAKS has been one of the most formative and gratifying experiences of my life. In addition to learning the essential details of starting an organization from the ground up, I also came to understand the importance of pivoting to better fulfill the needs of my community. In five years we grew from supporting mountain farmers in Ecuador to serving changemakers internationally working in five different program areas, including energy and environment, youth development, agriculture, food and nutrition, and strengthening family and community. I became skilled at coaching people in the exciting new field of crowdfunding, giving me the gift of meeting hundreds of inspiring individuals with groundbreaking ideas for making the world a better place. I am overwhelmed with gratitude for the incredible support and encouragement that my dear friends, family and colleagues have provided over the past five years. I want to keep this brief, so please know that I am sending you waves of love if I have not yet had the opportunity to do so in person. In particular, I would like to reiterate my appreciation for my co-founders, Steve Sherwood and Chris Sacco, who hatched the original idea for Peaks Over Poverty on a mountaintop in Ecuador. I would also like to thank my dear friend, Tony Amoyal, who created the first website for PEAKS and turned our idea into reality! An enormous thanks goes to Kenneth Schlather, the Executive Director of Cornell Cooperative Extension of Tompkins County (CCETC). His vision for PEAKS, and his collaboration and partnership through CCETC, catalyzed PEAKS and made it the successful platform it is today. I want to thank Pat Haggerty for developing a highly functional, user-friendly platform; Pat is one of the most exceptional out-of-the-box web developers I have ever had the pleasure of working with. I am deeply grateful for the warm, dynamic CCETC community, which embraced PEAKS with an open mind and an open heart. I will be forever thankful to my husband, Bobby, and my family for their steadfast encouragement and support. I am positively overjoyed knowing that PEAKS will continue to grow and thrive under Ray’s leadership. I will be cheering heartily from the sidelines! I am so grateful for all your support to PEAKS, and look forward to collaborating in the future. Thank you, from the bottom of my heart, for joining me in funding the change we want to see in the world! With enormous gratitude and HAPPY NEW YEAR! Ray joined Cooperative Extension in 2010 as a Community Educator, informing residents in Tompkins County about the various alternative transportation options available to them. Ray implemented several public awareness relating to sustainable transportation such as CarShare on the Commons, which celebrated Ithaca CarShare and the rideshare platform Zimride, Bike to Work Day, which saw nearly 500 individuals commute to work in Ithaca via bicycle,World Car-Free Day, which awarded individuals with free bus passes for using public transit that day and many other activities. Ray has spoken at several conferences throughout New York State about sustainable transportation, specifically around education and community engagement. He has been published by the National Center for Senior Transportation, a program of the U.S. Department of Transportation, Federal Transit Administration and the U.S. Administration on Aging for examining senior drivers and their attitudes towards transportation barriers, and has written nearly $1,000,000.00 in funding proposals to continue transportation education in Upstate New York. Ray became more involved in Fundraising and Event Management in 2011 when he was asked to be the Marketing Coordinator for the Tough Turtle, Ithaca’s first 5K obstacle course. Through various social media, print and broadcast marketing initiatives, this first-year event sold out in under 15 hours, and raised nearly $70,000 dollars. Shortly thereafter, Ray was asked to oversee an annual 5K race for 4-H Youth Development, a fundraiser that typically had 100 participants and raised $1,500. By making a few small changes to the event, it grew to having over 600 runners and raising nearly $10,000 that year. Seeing the interest and popularity in these types of events, Ray took a leap of faith and organized a glow-in-the-dark 5K race, once of the first of its kind nationwide. This race was one of the largest ever in Ithaca with nearly 2,400 runners and raising approximately $30,000. In addition to 5K races, Ray has organized other events such as benefit dinners, community service events and capital campaigns. Ray brings his campus and community connections to the table as the new Director of Peaks, and is looking forward to helping individuals accomplish their crowdfunding and fundraising goals using the Peaks Platform! There’s no question about it. In the digital age, with less time spent reading online and amateur filmmaking at our fingertips, video has become a critical tool for telling your story. A well-made video is concise and feels personal, and has the potential to be one of the most powerful forms of online fundraising. Sharing your passions and beliefs on video is almost as good as telling someone in person. On PEAKS, the highest performing campaigns – like The Learning Web – used video to broadcast their message. Kickstarter, a popular crowdfunding platform for creative and artistic projects, requires that users make a video for their fundraising campaigns. Indiegogo cited that 53% of the campaigns that reached their goal made a video of less than three minutes. Making a short, sweet, powerful and punchy video isn’t easy. As Changemakers, we often get lost in the history of our organization and mission, the details of our programs and vision, and the common fumbling “ask” for money. It’s hard to get crystal clear and reconnect with the moments that motivated you to make the world a better place. The key to a successful video pitch is finding a good story – that golden nugget which pulls on your viewers’ heartstrings while helping them understand what you do, why you do it and how much you need to keep making a difference in your community. Your story represents 90% of your fundraising pitch, but the remaining 10% – your “ask” for money – is crucial. Your story hinges on the “ask.” So, how do we identify all these pieces and put them together in less than two minutes (which is about as long as you can truly hold someone’s attention online)? We decided to try something completely new to help Changemakers craft a two-minute pitch in one hour or less. We teamed up with Regi Carpenter (professional storyteller) and Stacey Murphy (professional grantwriter) to work with the Executive Director of The History Center, Scott Callan. Over the course of one hour, Regi and Stacey guided Scott through a series of eight steps to weaving an expressive story with the organization’s mission, and concluding the message with an ask. We made two videos to take you on Scott’s journey through Regi and Stacey’s eight steps, and showcase his final two-minute fundraising pitch. Below, we’ve included the 8-Step Guide to Crafting a Two-Minute Fundraising Pitch. We hope these tools will help guide your own process in crafting a two-minute fundraising pitch. 1. Identify a clear mission statement. What is your organization’s mission? 2. Personalizing the mission statement. What memories from your personal life does the event spark? How does your personal experience influence you in your work? What makes you want to go to work everyday? 3. Blurt and blab (finding the story). Recount specific stories from your programming that stand out as exemplary moments of your mission statement in action. Be specific: use names, events, places and how the event tied into the overall implementation of the mission. Use your senses and emotions, and describe the setting. 4. Connecting the mission, personal experience and story. Craft the story that combines the event, your connection to the event from your life, and how the event is an example of a living mission statement. By this I mean, how does the event move beyond words and into actions that affect people positively? How does this validate your work and your organization’s programs? 5. Great story. Now, the ask. Many fundraising appeals fail merely because no one actually asked anyone for anything! 6. The dark side: how do you feel about asking for money? What is hard about asking for money? Get clear on what makes you uncomfortable about it? Why do you support the causes you do? When a donor makes a gift, he or she becomes a partner in a cause that is bigger. To work for important purposes and to take part in solving problems of great magnitude gives deeper meaning even to daily routines. People want to be involved in something with meaning. Shift the perspective: it is not about you, it is about the donor sharing your experience of changing the world! 7. Getting the words out: crafting a simple, short message. Begin with your story. Start with just one sentence about why you personally believe in the organization’s work. “As you know, my brother has Asberger’s Syndrome, and not much was known when we were kids. I think of what this program could have done for him when he was struggling.” Now, ask them to give. - Option 1: Keep it super-simple. For example, “will you consider making a gift of $100 to this program?” Take a deep breath, say it and exhale. Use a specific dollar amount. “Will you support our cause?” isn’t clear enough to show you are truly asking for money. One person’s idea of “support” may be forwarding your email and forgetting about it. Do the donor prospect the courtesy of plainly telling them what you need. - Keep Quiet. Asking for money can be daunting. Silences can feel like they last an eternity. While social media makes this easier, you may still feel like it’s hard, especially when you follow up with friends in person. When that happens, just say, “I really appreciate you considering my campaign.” Then, don’t change the subject to your kids or the weather or whatever might seem less prickly. Just stay quiet. It’s a great skill that all salespeople and successful business owners have learned and practiced – despite their discomfort at first. - Keep your Perspective. A really great batting average is far less than a hit every time. The law of asking for business, or donations, is that you have to ask many times to get the number of “yes” answers you will receive. A no is OK – you are just getting one step closer to your next “yes,” and in the process, telling one more person about your cause. - Keep your chin up. You support a mission you feel very strongly about, or else you wouldn’t be trying this! For you, success comes in just making the offer to share your great organization with others by telling its story. Always remember to conclude your pitch and “ask” by thanking the person. When someone becomes a friend of your organization, be sure to thank him or her personally, and see that they were properly recognized by the organization. Our top priority at PEAKS is to work closely with each and every Changemaker interested in exploring crowdfunding as an effective tool for raising money and building expanded donor networks and communities. In an effort to provide personal, hands-on support we would like to invite Changemakers to participate in our Crowdfunding Sessions: How to Raise Money with PEAKS. The sessions will be intimate round-table discussions with PEAKS Founder and Director, Emma Frisch. Participants will learn the concepts of crowdfunding and the benefits of using PEAKS, share their fundraising projects and receive direct feedback, and have the opportunity to ask questions about designing, launching and managing a successful campaign. In each session, our goal is for participants to gain the introductory tools and knowledge they need to feel confident introducing crowdfunding to organization and project stakeholders, and creating their own crowdfunding campaign. In an effort to provide each participant with dedicated attention and support, sessions are limited to three organizations and up to six participants (two representatives per organization). Registration is first come, first serve. If you are placed on the waiting list we will inform you when a spot becomes available. Please fill out the REGISTRATION FORM. Welcome to Social Media 101, the first of three installments designed to teach you how to use social media like a pro to promote your campaign, gain public visibility and grow your network of supporters and contributors. As discussed in our previous blog posts - Secrets to Launching a Successful Crowdfunding Campaign and Why Crowdfunding Campaigns Succeed - using cyberspace can give your campaign a MAJOR boost. Traditional methods – like phone calls and handwritten letters – have proven effective over time, but harnessing the power of social media can help you reach hundreds, thousands, and even MILLIONS of people with just a few quick clicks of the mouse. The more people you reach, the more money you raise and the more people with whom you can share your cause and your passion. In this installment, you will learn the basics of Facebook and Twitter, and how to optimize them with PEAKS. Let’s Get Started! In case you haven’t heard of it, Facebook is an interactive social networking site that was first created for college students. Before long, it exploded into a communications mecca used by almost everyone in the world, including celebrities, companies and organizations. Facebook superpowers lie in its ability to create buzz and gain publicity through pictures; article and content-sharing; engaging in online conversations with friends, family, fans and customers; and showcasing progress, products and more. In Social Media 101, we will start by introducing you to some basic definitions. (For more Facebook basics, check out Facebook’s Glossary of Terms). Now, how do Facebook and Twitter work with PEAKS? Once you’re in the “Tell us about your Cause” page, fill in all the applicable information. You can copy and paste the URLs from your Twitter or Facebook profile pages. After saving, Facebook and Twitter icons should appear towards the bottom of your Campaign page. Sharing: Once your Campaign is approved, you’ll see “Spread the Word” in the right hand corner of your Campaign (or Champion) page. Choose the social media icon where you want to share your page. Click it, customize your message, and post it to the world! We at PEAKs hope that this first edition of our Social Media blog posts were helpful! Practice your newly gained skills and let us know what you thought via a comment on our Facebook page or via a tweet on Twitter! And don’t forget to like and follow us! What they did best: CFTC’s campaign was successful for a number of reasons, including: their ability to create a focused, engaging narrative; to set an achievable goal; and to effectively utilize their team of 9 group members’(champions) respective networks. By providing examples of the inspiring work accomplished by women in the community, CTFC explicitly shared their vision to “continue this important tradition” through The Women’s Fund Endowment. Such transparency – along with CFTC’s 14-year history of effectively serving Tompkins County – instilled trust in people donating to this campaign. Aware of their great reputation and the strength of their networks, CFTC was able to set an achievable goal of $5,000. All of the aforementioned – further bolstered by social media marketing and personal follow-up to thank each donor - made it possible for CFTC to exceed their fundraising goal. What they did best: In addition to including a clear, heartfelt narrative and images in their campaign description, 4-H acres took advantage of their Updates. The Updates section of a campaign provides a way to share visual progress and rich content that links back to the DONATE button. For example, 4-H Acres posted an Update of the renovations on the central building, which regularly houses children’s camps, classes and workshops. By sharing the link through social media and email, 4-H acres gave potential donors a “real” way to connect with their cause and feel compelled to contribute. In addition to providing a way to share progress, Updates helped donors foster a sense of trust in the organization’s ability to carry out the proposed project. 4-H Acres also used local events as a primary vehicle for spreading the word about their campaign. By taking advantage of in-house events and affiliated youth activities, 4-H was able to promote their campaign to people who were dedicated to their programs and the building’s safety, functionality and comfort for children. What they did best: By recruiting their most loyal supporters and producing engaging video clips, The Learning Web was able to raise over $8,000 in just five days – more than 25% of their $20,000 goal! The campaign organizers worked with twenty-one champions to produce short, personalized videos for their individual profiles. Additionally, The Learning Web included a montage of champion videos on the campaign homepage. When potential donors and new champions visit The Learning Web campaign, they can instantly watch staff, beneficiaries and other supporters explain why they cherish the organization and their mission to help children (a quarter of which are homeless) ignite their passion as they journey down the path to adulthood. This campaign is the perfect example of the power of video. The Learning Web also did a remarkable job recruiting champions for their campaign; they had 21 champions set up profile pages before the campaign was scheduled to launch. They hit the ground running, AND they had a team of people devoted to spreading the word and helping The Learning Web reach its fundraising goal. In this way, The Learning Web gained widespread visibility and an expanded donor network. What they did best: Being innovative is always the shortcut to success. GreenStar Community Projects (GSCP) combined two major techniques: “recruiting active champions” and “hosting an event to boost local promotion.” In promoting the Food Justice Walk-a-thon, GSCP targeted “Walkers” or champions from the community, who love exercise, enjoy nature, care about the environment and are passionate about food justice. As a result, GSCP recruited 104 champions who leveraged donations from 242 individuals in their personal networks. GSCP came very close to reaching its goal while building an expanded donor network. What they did best: This bowling tournament was another successful “event style” crowdfunding model. Local events and activities are great ways to get a group of people with similar interests together, and use those passions to raise relatively small amounts of money. The Nevada Partnership for Homeless Youth set a reasonable target of $2,000 and exceeded their goal; first-time success helps campaign organizers gain credibility for their next campaign. What they did best: Not only did this campaign raise a whopping $137,539 for their cause, but they also recruited “big-name” champions like YGL Harvard 2010, which raised $15,975 (more than 10% of the total funds raised). This campaign demonstrates the power of networking with institutions and individuals that share your interests and beliefs – don’t be shy about it! In fact, sometimes institutions and people wishing to help are looking for more good projects to support. Their Facebook and Twitter accounts were also well managed in terms of number of followers and consistency in posting and promotion; both are powerful tools to have at your disposal when trying to reverberate your cause across cyberspace. What they did best: This case is another good example of using dynamic video to tell a story. The organizer filmed himself throughout his journey, providing a unique, first-person angle on his campaign and making his supporters feel like they were partaking in his challenge. Making a video like this may require some degree of skill or access to equipment, but the bottom line is: be creative and get in front of the camera and start talking! What they did best: This is another case from Indiegogo.com, a website which prioritizes video. This campaign created a high quality video to share the stories and dreams of the students they are supporting in Sudan. The video details how the students were selected and clearly describes the project expenses, building confidence in their donors that their contributions would be used to change the lives of Sudanese children. The video was heartfelt, clear and powerful. What they did best: We’ve included this campaign as an example of how one might use their passion to support a worthy cause. In this case, the campaign is centered on the production of a product – a fashionable, reusable bag – designed by fashion designers committed to using locally available resources. The nature of the product supports the reduction of waste and environmental conservation. What they did best: The techniques in this case are not fancy or unique. This campaign combines a clear narrative with a touching video and an event – the results are amazing. So far the community kitchen program raised $25,156 in less than a month. Both the narrative and the video were short and sweet, allowing the audience to grasp the story quickly and clearly. Meanwhile, the host challenged herself to run 31 miles to match her fundraising goal. Undertaking such a challenge can draw significant attention and funding to your cause, especially from close friends, family and personal acquaintances who want to see you succeed.